I hated it when my folks made my brother and me wear exactly same shirts. Worse was when the young sis wore her frock made from the same fabric. “Matching-matching”, people would say with a wide toothy grin and I would fume in anger. But hey, now the Czar of fashion – Karl Lagerfeld is doing the same. He too is promoting same-to-same fashion for couples, which is even worse. Look at the Chanel Pre-Fall campaign for 2010 below. Shot by Karl Lagerfeld, Mirte Maas and Baptiste Giabiconi (Lagerfeld’s male muse) look every bit the sophisticated and chic Chanel-clad couple. 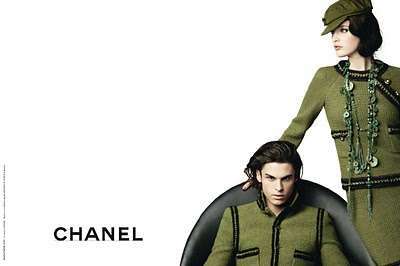 So coordinated are their outfits for the Chanel Pre-Fall campaign ads, it almost borders on the nauseating. I won’t be caught dead wearing ‘matching-matching’ stuff with my girlie. Would you?? ?